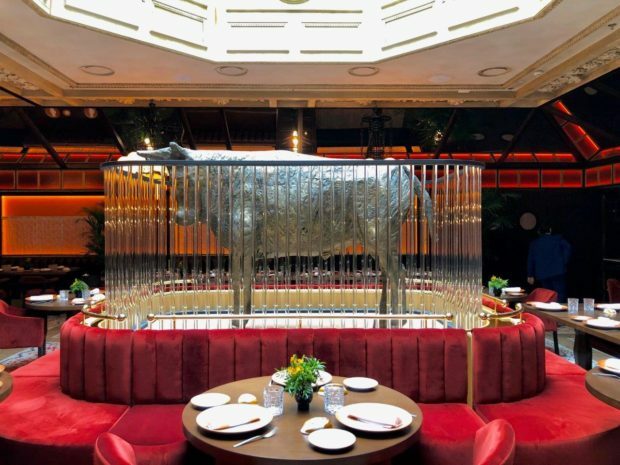 A life-size Iberian bull, cast in silver alloy, held in a crystal pen, flooded by natural light from the glass dome above, is the centre piece of the new Lázaro Rosa-Violán designed ‘Etxeko Madrid’ bistro restaurant in Madrid’s chic Salamanca district, writes Andrew Forbes. 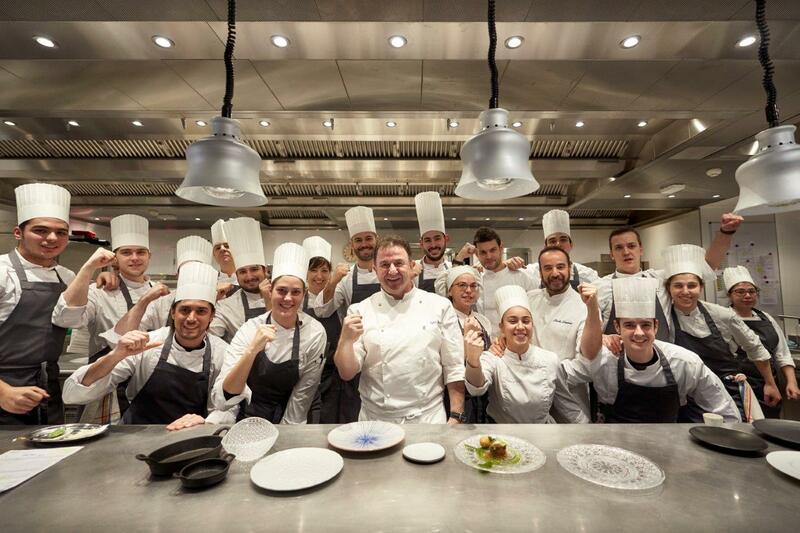 Martín Berasategui is Spain’s most decorated chef (in terms of Michelin stars – he has 10!) – and he has been a driving force in shaping contemporary Spanish cuisine. 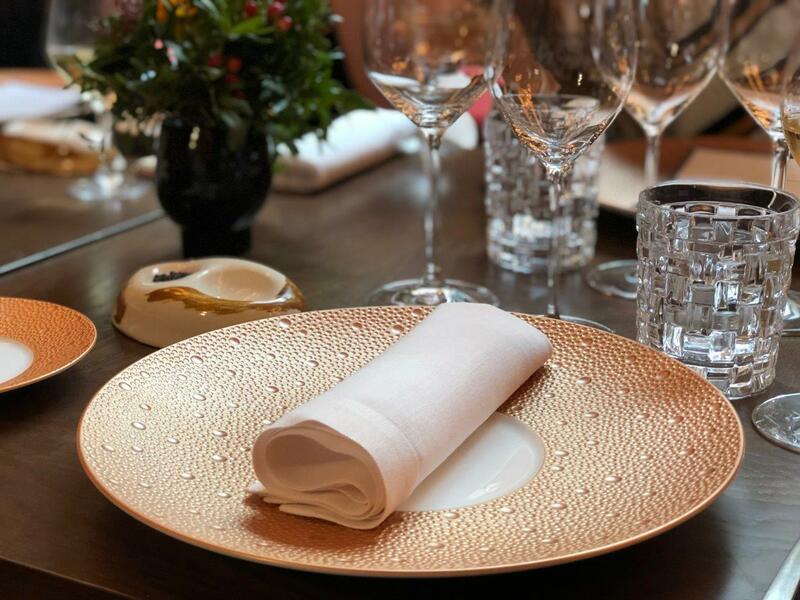 Etxeko Madrid is the chef’s latest venture, bringing a taste of the north to the Spanish Capital; in collaboration with BLESS Madrid, the stunning new flagship luxury boutique hotel from Palladium Hotel Group. You can read my full profile review of BLESS Madrid Hotel here. Earlier this month, before the official launch, I was excited to have been invited to eat at Etxeko Madrid. 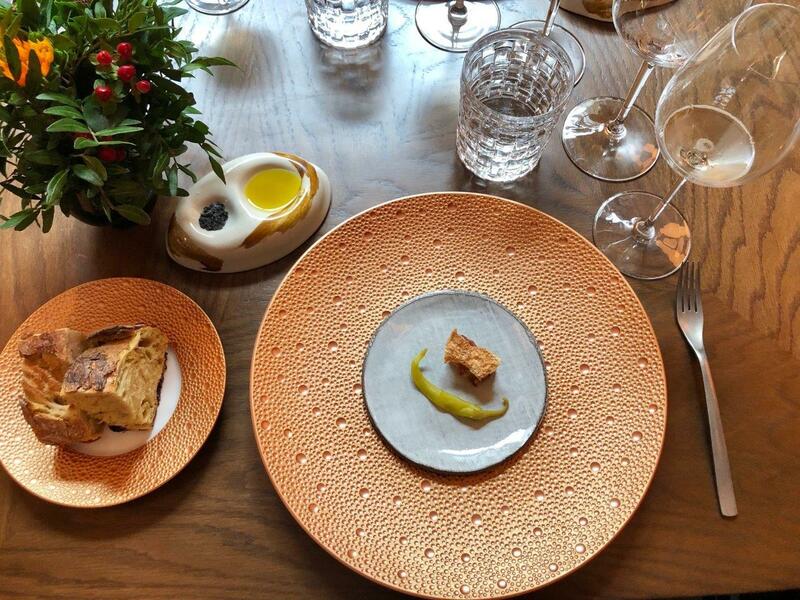 It was a privileged opportunity to try a selection of dishes from the kitchen of Martín Berasategui, from both the upscale bistro restaurant menu, and the ‘Versus’ Lively Lounge of the new BLESS Hotel Madrid. I’m told that ‘Etxeko’ means home or homemade, in Basque. It’s a clue to the menu and style here. 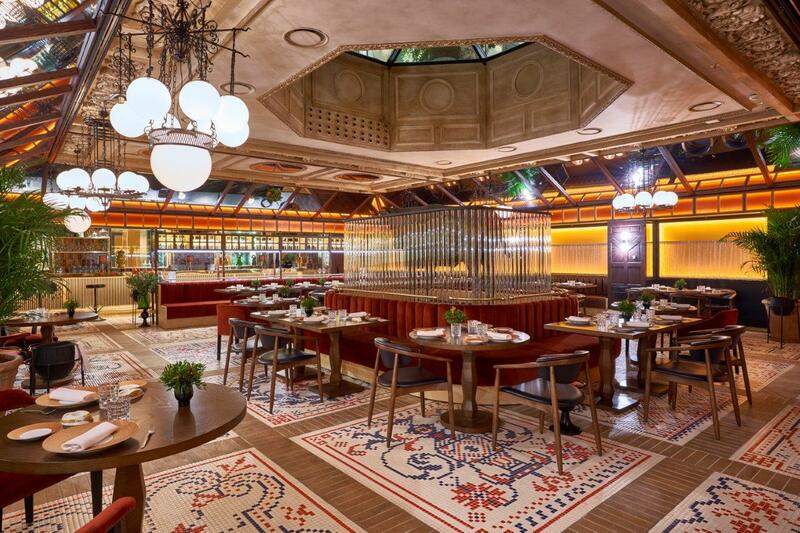 The restaurant design, with mid-century inspired ceiling lamps, tiled floor, polished warm woods, amber wall panels, and crimson velvet seating creates an elegant bistro vibe rather than a theatre for experimental cuisine. In my experience the food was on the whole sophisticated yet unpretentious. This is a place to relax, enjoy food with friends and family – confident in the quality of the gastronomy and the service. This isn’t the place where boundaries of cuisine will be challenged. 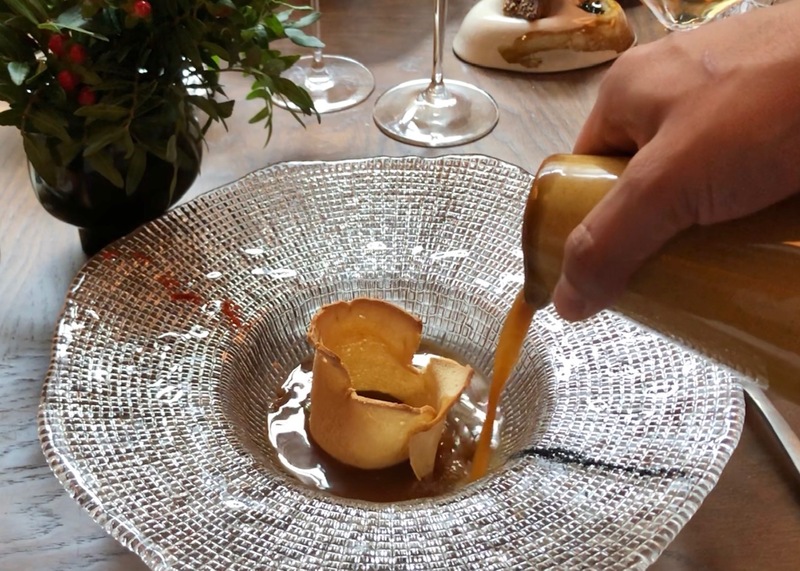 The menu echoes Berasategui’s roots in northern Spain. You can order Steak Tartare Etxeko; beautifully presented octopus; market-fresh seafood and satisfying dry-aged Basque beef. Yet the menu also includes classic Spanish taberna produce like suckling pig; and oxtail. The china- and glassware was beautiful – elevating the homespun recipes to fine-dining; which was deserved for the eloquent, complex construction of flavours; attention to detail; and accompanying professional waiting service. (I did think though that the silverware could be upgraded to something more elegant inline with this beautiful restaurant). Despite only being open for a few days the team worked well together and we enjoyed excellent attention by the waiting staff. 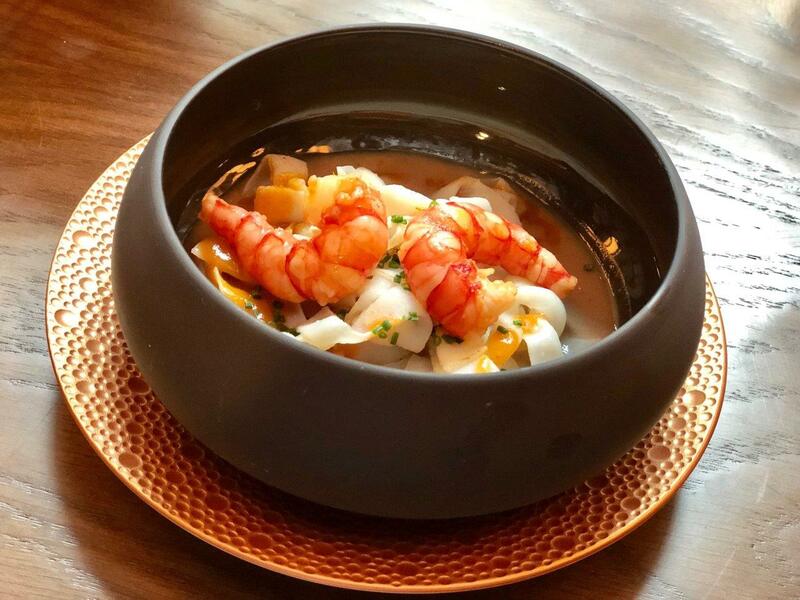 The innovative and creative starter of ‘tagliatelle’ of squid, with prawns and creamed sweet potato was a favourite – bursting with seafood flavours; and the price, an accessible 24 euros. We also tried the Castilian soup (from the hotel’s ‘Versus’ Lively Lounge bar menu). 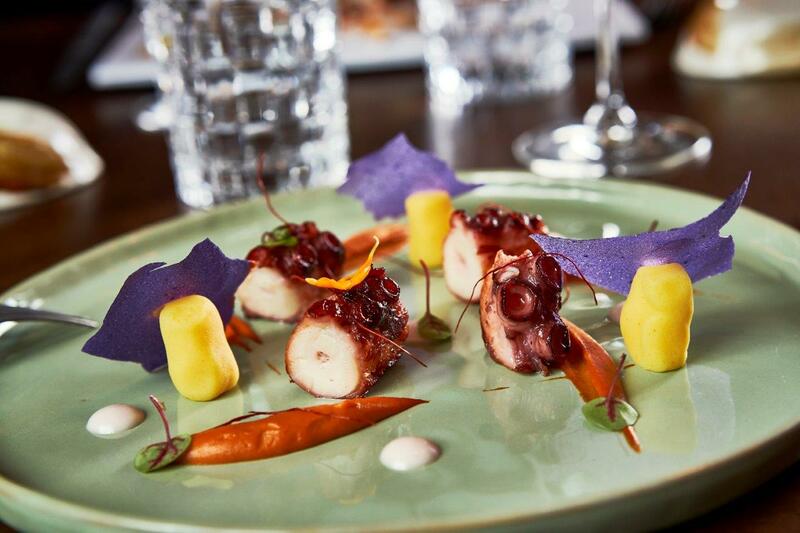 A stylish, modern take on the classic Spanish country recipe – a light consumé with robust flavours. 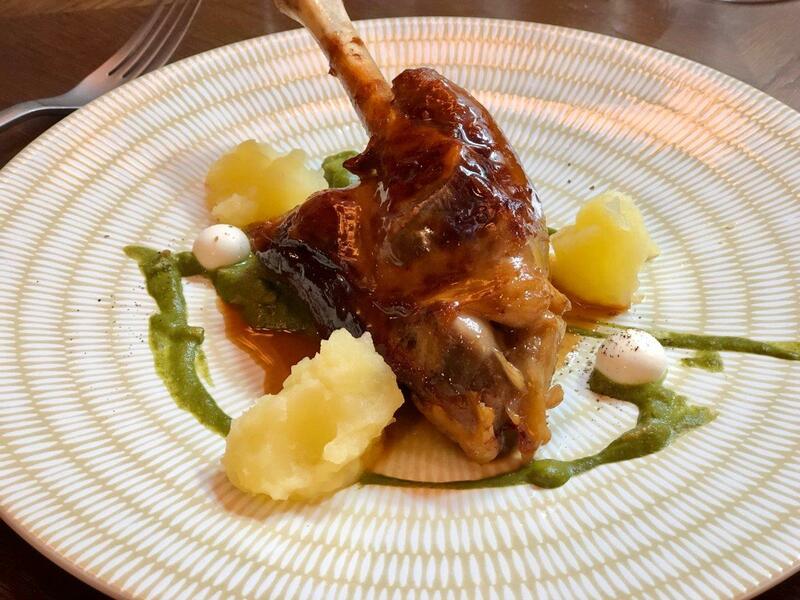 The main dish of Lamb Shank, a winter warmer, was simply presented with ‘broken’ potatoes. It was also 24 euros. 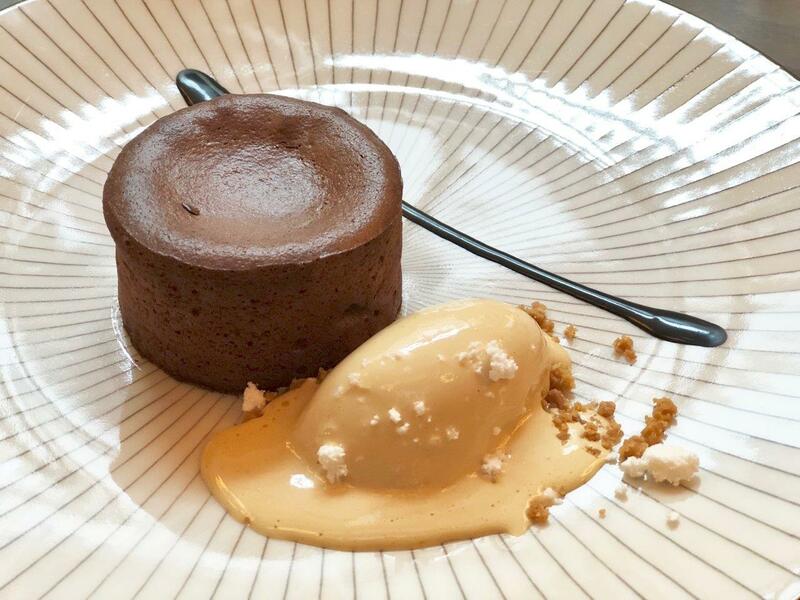 Pudding was a chocolate souffle with caramel ice cream– much like the ever-popular chocolate fondant (molten chocolate cake) that I have seen on menus since the 90s. I was surprised to see this on the menu – especially from a 10-star Michelin chef in his new Madrid restaurant. Comforting bistro food indeed – but maybe I was expecting something more surprising. Wines are selected by sommelier Cristina de la Calle – another highlight. Cristina appears reluctant to take the limelight, yet her wine list is a delight. Interesting choices for our lunch included a Cantabrian white ‘K5 Argiñano’ (Hondarribi Zuri grape); and a Madrid red ‘El Rincon’ (Syrah grape; and Garnacha). The restaurant has 88 covers and private dining areas. The BLESS Madrid Hotel (member of Leading Hotels of the World) is the flagship of a new collection of properties from Palladium Hotel Group. BLESS will include urban, as well as resort properties (BLESS Ibiza opens this summer); and is focused on creating contemporary luxury. BLESS Madrid has 111 rooms and suites and has placed food and beverage at the heart of its hedonistic luxury philosophy. 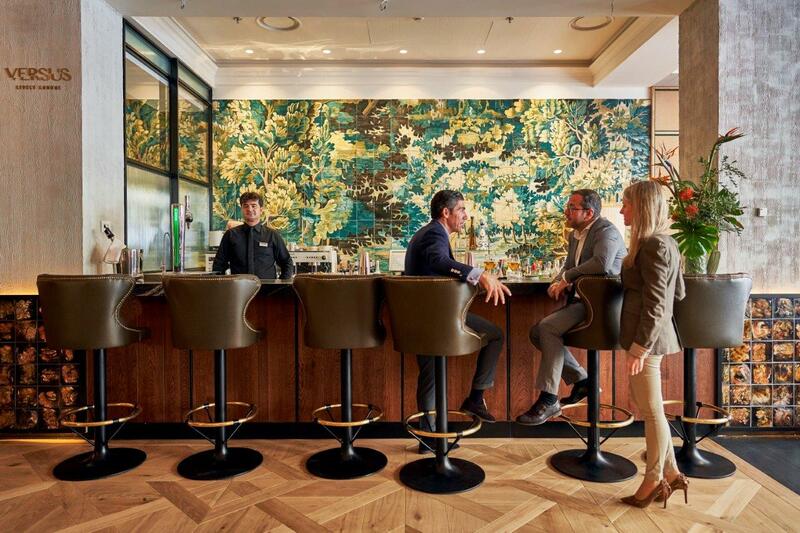 This fabulous hotel is at Calle Velázquez 62, in the posh Salamanca district; and offers guests a buzzing lobby bar & restaurant, the Versus Lively Lounge; and in the basement, the Fetén Clandestine Bar, complete with bowling alley; and the Picos Pardos Sky Lounge which is scheduled to open this summer. Martín Berasategui has 10 Michelin stars – 1 Michelin star for Restaurante Oria (Barcelona); another star for Restaurante eMe Be Garrote (San Sebastián); 3 stars for Restaurante Martín Berasategui (Lasarte); 3 more for Lasarte (Barcelona); and 2 for Restaurante MB (Guía de Isora, Tenerife). Lunch from 1.30 p.m. to 3:30 p.m.
Dinner from 8:30 p.m. to 11:00 p.m. Lunch from 1:30 p.m. to 4:00 p.m.
Dinner from 8:30 p.m. to 11:30 p.m.